The use of fire as a weapon of war has a long history. In Norman times, those attacking castles would sometimes catapult burning wood and straw over the walls in the hope that it would set fire to something important, thus diverting the efforts of those defending the castle into fighting the fire instead. In Elizabethan times, when warships were sailing ships made of wood, it was a recognised tactic to set an unwanted, perhaps captured, ship on fire and allow the wind to carry it among the enemy ships at anchor. On a foggy day, the burning ship could get close to the fleet before it was seen, and be among them before they could set sail and raise anchor to escape. If the fire ship could set the sails alight, the fleet could not escape and many would be destroyed as the fire spread. This tactic was used very successfully by Sir Francis Drake against the Spanish Armada. By the time of the Second World War, it was possible to deliver fire from an aircraft, in the form of incendiary bombs. Benzene is a colourless liquid hydrocarbon derived from petroleum or coal tar. It vaporises easily and burns fiercely. Phosphorus is a highly reactive chemical element which spontaneously bursts into flame on exposure to air. It was contained in small glass bottles inside the bomb casing, and the glass shattered on impact, allowing the air to reach the phosphorus. The flame from the burning phosphorus set fire to the benzene, and the heat from the burning benzene set the rubber alight, to give a long burning time. In the early years of the war, incendiaries were a variant of the 50Kg bomb, but filled with benzene, rubber and phosphorus rather than the normal explosive. Phosphorus creates unpleasant fumes when it burns, hampering fire fighting efforts. However, this design of bomb spread fire over a fairly wide area, and did not burn with any great intensity, so it was not particularly effective at creating fires on the ground. It also had the disadvantage of being 20 cm in diameter and weighing 50 Kg, which limited the numbers that could be carried on each aircraft. This is the type of incendiary bomb that was dropped on Bath in 1940. They were nicknamed "oil bombs". By 1942, the magnesium incendiary was being used. This was made almost entirely of magnesium with a steel tail and a small detonator to start it burning. Magnesium is a metallic chemical element which burns in air with an intense heat once it reaches the temperature at which it will burn. Burning magnesium reaches a temperature of over 1000° Celsius, so these incendiaries were very effective at starting fires in spite of their small size. In the presence of water magnesium gives off hydrogen which also burns, so once it is alight it cannot be extinguished with water. This type of incendiary bomb weighed only 1 Kg and was 5 cm in diameter, so a single plane could carry several hundred, and in total, over 4,000 were dropped on Bath. Incendiaries provided a tactical advantage to attacking bombers, because fire provides light. Once fires are burning, they illuminate the area around, so that the targets for the high explosive bombs can be identified. Fires also destroyed homes, factories and food stocks, and the people affected were diverted from their normal lives, thus hampering the war effort. At the outbreak of war, the authorities produced regulations intended to minimise the danger to the public. Local Authorities were required to produce information booklets for their residents. 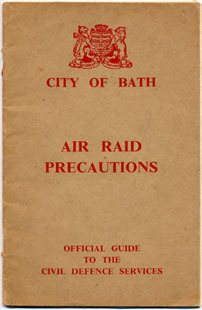 The Bath Council booklet gave elaborate arrangements in considerable detail, and it seemed that every possible eventuality had been provided for, including the setting up of Incident Posts and local wardens, so that word could be spread quickly to the general public. Rescue services and casualty procedures were set up, covering the full range from first aid to fatalities. Emergency food and accommodation was provided for. The booklet included dealing with the fires anticipated from the use of incendiaries. Although fire was acknowledged as a potential menace, the majority of the advice to the ordinary public concerned the threat of a gas attack, and decontamination afterwards. Everybody was provided with a gas mask, but a gas attack never materialised. As well as the main Fire Station at Cleveland Bridge, smaller stations were set up in Lansdown Road, Upper and Lower Bristol Roads, Englishcombe Road and Bear Flat. Thus if a fire station was bombed, a significant amount of fire fighting capability remained. Water tanks were installed around the city so that the Fire Services could use them as water sources if the hydrant supplies were disrupted, and three moveable floating pumps, each capable of pumping 700 gallons (3200 litres) of water a minute, were installed on the river: one above the weir to serve the Walcot and Snow Hill areas, one by Old Bridge to serve the city centre, and one by Windsor Bridge to serve the Weston area. At the start of the war, 9 Km of hose was available, enough to deliver water from the river to anywhere within the city boundary. Some vehicles were fitted with waterproofed canvas water tanks so that they could transport water to any area. The fire service called them "Dams". The fire engines of the time carried fire crew, ladders, hoses and a pump. They used water from hydrants, ponds or lakes to fight fires, but did not carry water with them. The effectiveness of these "Dams" did not go unnoticed, and after the war, a fire engine designed to carry its own water supply was designed and brought into service. 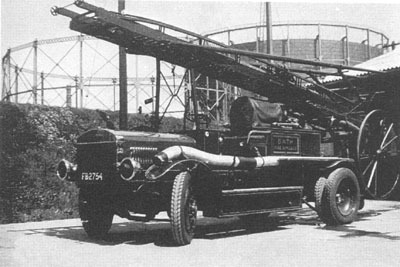 These lorries towed a pump behind, and were effective at getting to small fires quickly, and dealing with them before they became large fires. Ordinary lorries were used. The one in the picture used to deliver fruit before the war. All able bodied men were required to take their turn fire watching. Fire watches were required by law for all business and residential premises. The watchers were provided with buckets and a stirrup pump, sandbags, scoops and rakes. A stirrup pump had a body which went into the bucket, and a small platform which went onto the ground beside the bucket, so that the user could hold the pump steady with the foot, while working the pump with the hands. The foot pedal was shaped like a riding stirrup, hence the pump's name. The picture shows one being used for practice. Residents were asked to ensure that attics and top stories were cleared of inflammable materials as far as possible. Fire watchers were supposed to guard the roof areas of buildings, and whenever possible use rakes to dislodge incendiaries and drop them to the ground where they could burn harmlessly. Otherwise, they were supposed to douse the incendiary with sand. 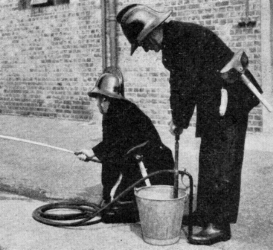 The stirrup pump in a bucket of water could be used to prevent the spread of any fire left behind after the incendiary had been dealt with. The design of Bath's Georgian buildings, where the roof was in two parts with a central rainwater gutter made of lead between them, made them particularly vulnerable to incendiaries. If one fell between the two sections of roof, it would very quickly melt a hole in the lead and fall through onto the roof support timbers, which then caught fire. By using the fire watchers to prevent fires starting, or to contain them as much as possible if they did, the fire service could concentrate on the larger fires and those that affected premises essential to the war effort. How Effective Were The Fire Precautions? These precautions, variously described in Government leaflets and the Bath City Council booklet, should have provided effective measures against the risk of fire and adequate measures to fight them. But after two years of scheduling fire watches every night, during which time with very few exceptions the planes dropped their bombs elsewhere, fire watching was considered a waste of time by many of the fire watchers. Only the fact that there was a law requiring fire watchers to be in place kept the posts manned at all. But the watchers had work to do during the day, so spending several hours a night guarding rooftops was unwelcome, and absenteeism was common. A Government audit strongly criticised Bath's efforts. The audit report was discussed in council meetings, but there is little evidence that any real action was taken to improve the situation. Bath's fire service had reasonable equipment. Very little apart from hoses and free-standing pumps was brand new, but even the 20-year-old fire engines (like the one pictured in the Lower Bristol Road station) were well maintained and reliable. The fire-fighters were well trained too, and had often been in action assisting with the fires resulting from the bombing of Bristol. On the first night when Bath was the target for the bombers, there was nothing to suggest that this time the sound of the air raid siren was an important warning to Bath. One fire crew was despatched to Bristol, as they had several times before, only to find to their horror that this time the fires were behind them rather than ahead of them. The fire watchers that had bothered to turn up for duty discovered that their equipment and training was not sufficient to deal with over a thousand incendiaries falling in less than an hour, amid the explosions of high explosive bombs. The first few bombs hit the gas works, where two of the four gasometers (one of them full of gas) caught fire sending a wall of flame skywards. Five fire pumps fought the blaze when it started, and this number had doubled once reinforcements from outside Bath had arrived. In Crescent Gardens, a bomb cracked a gas main, sending up a fierce jet of flame, and despite the efforts of seven fire crews, it burned long enough to set fire to the large stock of paraffin in a nearby shop. That shop, and the two houses either side burned to the ground. On the Lower Bristol Road, a petroleum depot was also hit and caught fire. The pumps on the river were effective as pumps, but the boats were under-powered and took a long time to move upstream, against the flow of the current. Many of the fires started by the first raid were still burning by the time the second raid started, so the Germans had no need to drop further incendiaries to improve their view of the targets. Few fire-watchers were at their posts. During the first raid, the planes had machine-gunned the streets as well as dropping bombs, and fire watching on a roof top would not have been safe. 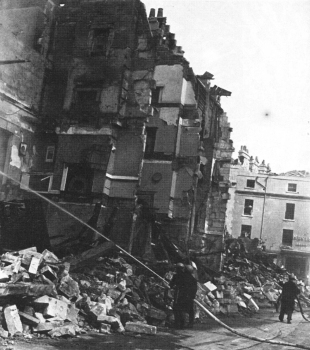 When dawn broke after the second raid, and the devastation could be viewed in daylight (like Northampton Street, pictured right), many people were afraid of what the future had in store. As night fell, many of these people left the city, afraid of another raid. So when the third raid came, there were few fire watchers to deal with the fires from another thousand incendiaries, and the fire-fighters were faced with breaking down the doors of locked houses and factories to get to the fires which were burning inside. The delay in gaining entry allowed fires to gain a greater hold than would otherwise have been the case. More fires took hold after the third raid than after the previous two. The fire-fighters performed well, but were very stretched by the sheer number of fires. Outside help came from Bristol, Swindon and other stations in the rural areas around Bath. The fire service records show that at the peak of their activity during the first night, 74 pumps were tackling 25 major fires. After the last raid, 128 pumps were fighting 35 major fires. The decision to install emergency water tanks around the city was a good one, and there were a number of fires fought with this stored water. Unfortunately, fire-fighters from outside the area did not know where many of the addresses of emergency water supplies were, and fire equipment had not been completely standardised. This outside assistance was sometimes delayed until somebody with local knowledge could direct them to the emergency water sources. There are also reports of a fire appliance from outside the city unable to fight the fire it attended because their pump and hoses would not fit on the Bath hydrants. In the picture of the fire engine above, the closeness of the gasworks to the fire station on the Lower Bristol Road can be clearly seen. Unfortunately, when a gasometer was bombed and it caught fire, the heat was so intense that the Lower Bristol Road fire station had to be evacuated for a time. When planning the fire services, nobody seems to have estimated the number of serious fires, or the number of additional fire pumps that could arrive in Bath from the surrounding towns to fight them. At one stage, fire-fighters had to be asked to used stored water from the emergency tanks or water from the river rather than water from hydrants. With the number of pumps in use, Bath's reservoir was running low and the entire city's water supply was in danger of running out. After the war, it had been calculated that when all the available fire pumps were in use and connected to hydrants, they could have completely emptied Bath's reservoir in only four hours.